We are proud to carry a large array of products at Battisti's Salon and Day Spa. Click on the links below for more information on the lines we carry! Also, be sure to check out our Featured Products of the Month! A unique formula that is based on one of the rarest oils of the world. This oil is known as Argan oil. It is 100% natural and certified organic. This amazing leave-in treatment provides hair with a soft silky feel and brilliant shine. Agadir is a dry, non-greasy treatment that absorbs instantly into the hair. Hair is nourished, moisturized and strengthened instantly. Excellent for repairing split ends, preventing breakage and color fade. Also, drying time is cut in half. Johnny B. is a professional hair care product line made specifically for those that love that "classic" look. Our extensive array of pomades, gels and sprays are sure to keep you completely satisfied and looking "tops" all night long. KMS California has developed a powerful nutrient system with reconstructive and conditioning agents to protect the hair. Fused with California native natural ingredients, which work harmoniously to reveal more vibrant looking hair from the inside out. The exotic blends of the ingredients are also reflected in the fragrances! 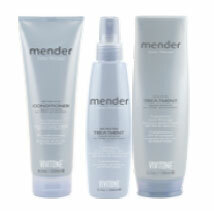 Mender products are specially formulated for color treated hair. Contains a rich nutrient complex of natural extracts, silk protein and panthenol to replenish moisture & restore hair to a healthy condition while protecting color from environmental damage, and provide smooth hair. L'anza's Strait-Line contains four temporary curl-relaxing formulas specifically designed to smooth curls, tame frizz and control waves. Each humidity resistant product contains healing actives to instantly transform rough, dry, frizzy hair into smooth, shiny, silky hair. Advanced ingredients preserve haircolor and protect hair against heat during thermal styling. The result is vibrant-looking hair that glows with a healthy sheen. Achieve volume through strength and healing. To build volume, hair must first be healed. Hair that is dull, limp and flat has a damaged cuticle and cortex. KB2 heals hair, giving strength and integrity to each fiber for full, bodified hair that is smooth, shiny and gorgeous. Solidify your style with a power hold finish. X2 Power hold products provide 24 hours of hold without stiffness or sticky residue. Therapro MEDIceuticles Thinning Hair Solution has been developed by leading dermatological scientists who specialize in treating scalp, skin and hair loss conditions. Therapro MEDIceuticles feature FDA approved drugs and clinically proven formulations for treating dandruff, psoriasis of the scalp, seborrheic dermatitis, fungi and bacteria often associated with hair loss. The "W" line has cleansers, hair treatments, follicle treatments and vitamin complex's that contain the Femmigen Complex, a blend of vitamins, minerals, herbs and natural estrogens. This exceptionally high quality hand moisturizer offers long lasting soft smooth silky feel, seals the moisture on the skin while protecting the hand as if you are wearing a glove. 100% non-greasy. Footlogix, the most innovative product line offered for the U.S. pedicure market. 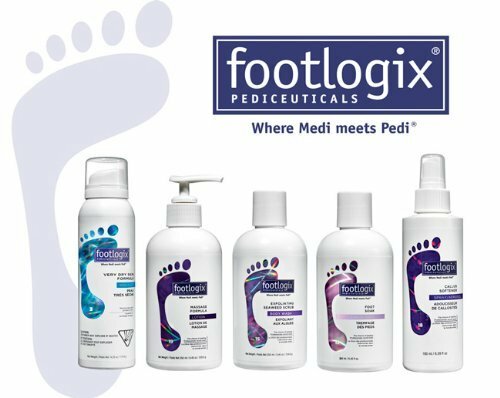 Made in USA, Footlogix provides effective care for a variety of skin conditions affecting the foot – from simple dryness to more severe conditions resulting from diabetes. Footlogix™ mousse is completely and quickly absorbed into the skin. It forms a safe protective barrier just below the skin's surface leaving no excess or greasy residue. The skin's overall health improves quickly – visible results are evident within days and continue to build with on-going use. Shade of nail lacquer you're looking for, Misa Cosmetics has got you – and your nails – covered. Each one of Misa's 72 fabulous nail lacquers gives you beautiful, long-lasting coverage. Plus, they offer high-gloss shine, are chip resistant, and won't fade. Best of all, Misa offers several new fashion-forward lacquer shades a year, which means an endless array of colors for you to choose from! Nutrinzix is the wonder of natural nail care because it is the first nail treatment product with formulations based on ingredients found in nature. 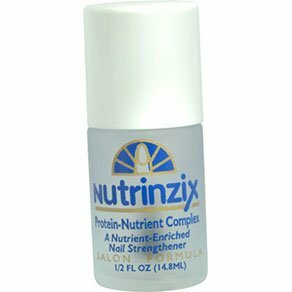 Nutrinzix combines nature's herbs, phyto-nutrient botanicals, vitamins and essential oils to create a system for revitalizing damaged nails and cuticles while nourishing healthy nails and cuticles. Seche Vite was the first patented single procedure non-yellowing dry fast top coat for nail polish that dried and protected the underlying nail polish much faster and created a more durable shield than anything on the market at the time and even to this day. It is still, after more than a decade, the finest and most highly acclaimed top coat for nail polish in the world. 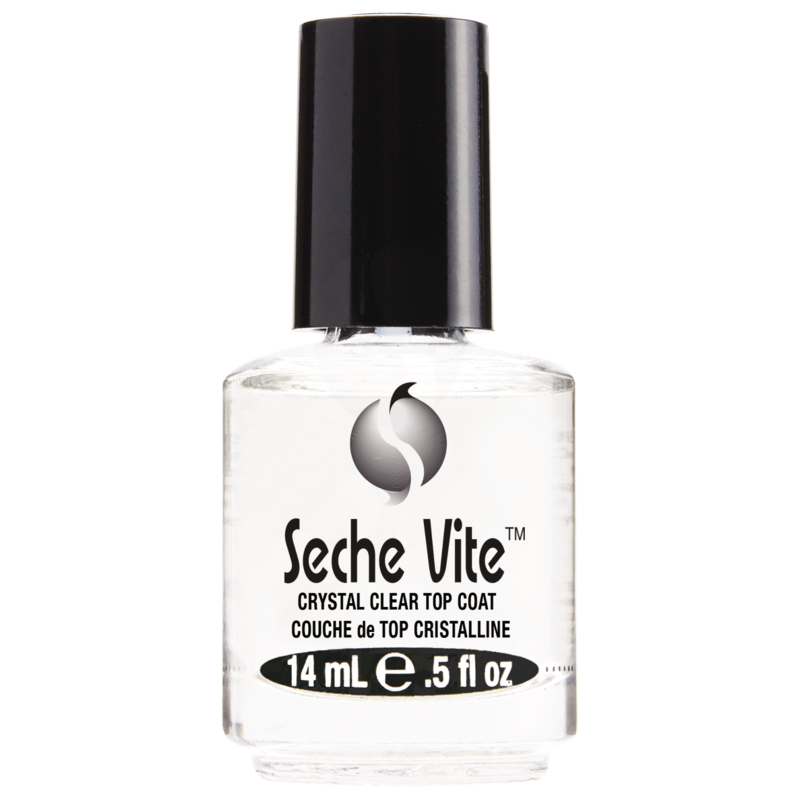 Seche Vite is the only truly clear non-yellowing top coat for nail polish on the market today. It is unique and the only place you will find the technology that Seche Vite embodies is in the Seche Vite bottle. Others may imitate, but there is only one true Seche Vite. Tammy Taylor products are known for keeping your nails healthy and beautiful. These products will help strengthen your nails, keep them from staining, and keep them looking their best at all times. 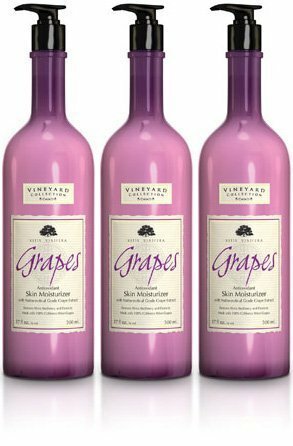 We are proud to introduce our first Eco-Organic Vineyard Collection blend of grapes, super anti-oxidant moisturizing lotion with age defying, 100% California grape extracts. This carefully crafted lotion blends the rich lipid sources or organic Jojoba, Olive and Avocado oil along with natural Shea, Mango and Aloe butter to restore skin's balance while leaving it supple and silky smooth. A fresh, delicious natural bouquet of harvest grapes and bergamot defines the character of this earth friendly total body moisturizer. Disease is generally not acquired; it is frequently created by, and often the result of, an unnatural lifestyle, an internal development which can lead to millions of people suffering needlessly. If we allow our bodies to become acidic, polluted and congested, we run the risk of weakening our glands and organs and they cannot function at peak capacity. We carry an array of nutritional supplement products to help our bodies achieve proper functioning, striving for a healthier lifestyle. Bloom natural products are from the shores of the Dead Sea. The Dead Sea is the lowest point on Earth and the largest natural beauty parlor. The Jordan Sea is the saltiest sea in the world and its water contains 32 healing minerals. The regular use of minerals in your daily cleansing and nourishing routine will enhance your skins liveliness and freshness. Battisti's Salon and Day Spa is the only source for Bloom products in the entire United States! This soap is formulated from the unique mud and mineral of the Dead Sea is mixed with pure and natural plant oils, free of any animal fats or detergents. It is both cleansing and conditioning for the face. It helps to nourish and purify the skin while reducing its impurities, to make skin healthy, clear and younger looking. This soap also treats acne, psoriasis and eczema. Tips: For maximum benefit, leave Bloom Mud Soap foam on the face for 1 minute before rinsing off. Powered with moisture-enabling mineral compounds and mixed with pure and natural plant oils, free of animal fats and detergents. This unique soap bar provides dual action benefits of cleansing and exfoliating the body. Wash away grime and impurities as your skin simultaneously enjoys the healthy replenishment of minerals. Tips: For maximum benefit, leave Bloom Salt Soap on the body for 1 minute before rinsing off. The natural and unique mud mask originates under the bed of the Dead Sea and is mixed with a blend of olive oil, honey, fragrance and aloe vera extract. A special formula that has been designated specifically to clean the deep impurities beneath the skin and keep the skin hydrated. It also helps to relieve most skin problems such as: psoriasis, acne and eczema. It assists with re-balancing the moisture of the skin. Helps reduce and delay the appearance of wrinkles and fine lines, giving you younger and softer looking skin. All day moisturizer enriched with natural Dead Sea minerals and active moisturizing agents. This unique Dead Sea formula is instantly absorbed helping skin to maintain its optimal hydration level. Leaves skin feeling soft, smooth and radiant. For every night care after using Bloom Balt Salt Soap or mask. This nourishing Night Cream is a one of a kind Dead Sea blend enriched with Vitamin E. This formula nurtures, revitalizes and replenishes the skins moisture level; leaving it smoother and glowing with vitality in the morning. This invigorating cream in enriched with Dead Sea minerals. Bloom Foot Cream is a wonderfully protective and healthy treatment for the feet. The cooling agent refreshes the feet giving you the feeling of comfort, while the natural oils help keep the skin on the foot supple and smooth! The CMI PEEL THERAPY line of products is on the cutting edge of skin care formulations that will produce very positive results for everyone. CMI PEEL THERAPY obtains better results than AHA's but in a much gentler fashion; and it actually avoids skin irritation and high dryness problems. This fantastic new line consists of products that are suitable for all skin types, and they really work! They diminish the appearance of fine lines and wrinkles, crows feet, frown lines, dark circles and eye bags, age spots, pigmentation, freckles, rough patches, coarse skin texture, blotchy skin, dilated pores, excessive oil, blemishes, new and old scar tissue, and stretch marks. The ingredients contained in these products have been specifically formulated to produce a skin care line that will augment your regular daily treatments. Institut Esthederm is a French cosmeceutical corrective skin care line. Institut Esthederm's vision to help the skin achieve its own perfect balance internally and externally, allowing the skin to adapt and protect itself from the environment. Institut Esthederm's approach is unique: to preserve and optimize the skin functions by providing the most efficient, active-yet gentle ingredients. The skin receives the best of all biological, marine and botanical worlds by selecting the purest ingredients, only the ones compatible with the skin. Institut Esthederm Laboratories (research center) have analyzed all the processes which slow down or destroy the skin functions. In spirit on innovation and creation Institut Esthederm works closely with biologists, nutritionists, chemists, bio-physicists and researchers from various industries. This approach has resulted in over 8o patents that make Institut Esthederm the most patented skin care line available today. Institut Esthederm's products are designed to specially help re-educate the skin to correct and repair itself. Oxygen BotanicalsTM is the first skincare line infused with pure oxygen that is not chemically derived. Most oxygen product lines utilize hydrogen peroxide, which produces oxygen through a chemical reaction and can bleach skin and facial hair and be drying to the skin. Oxygen Botanicals uses a proprietary process to stabilize and encapsulate pure oxygen into catezome structures. A skin care line which encompasses not only the most advanced scientific knowledge but also incorporates plant based technology is of strong interest. We inherently know that many of our needs can be met via the utilization of earth's resources, such as plants, but there is also a respect for science and how it allows for a sensible application of plant technology. This collection of advance color cosmetics combines the best in anti-aging technology and proven natural ingredients to protect and perfect skin- all with a little magic. Whether powered by super antioxidant Idebenone for its Environmental Protection Factor (EPF) of 95, natural sun defending minerals or skin enhancing botanicals, these multitaskers take action. Not all Products are created alike. Specifically designed to deliver choice and results, mineral technology unites with science to deliver a new level of protection. Refined textures are created to mimic skin with a modern range of color that coordinates to undertones—forward thinking for all skins.